If you ever detect ThugTracker on your PC, you should know that it is an unreliable program and it is very important to remove it from the system. Of course, you might think that ThugTracker is a useful application because it promises to allow users to access public records and thus you might not want to delete it; however, you should know that ThugTracker is not as useful as it claims to be. In fact, it seems that it is not going to act as it promises at all. We think that there is no point in keeping useless applications installed, so we suggest that you remove ThugTracker as quickly as possible. We recommend doing that very quickly because our specialists have revealed that ThugTracker might even cause harm to your PC. Even though ThugTracker promises to act in a useful way, the truth is that it shows various commercial advertisements only. In most cases, ThugTracker provides users with in-text ads, but you might see pop-ups, banners, and other kinds of advertisements as well. As can be seen, ThugTracker is nothing more than just an advertising-supported application, so you should not expect that it will act in a very beneficial way. Actually, it has to be emphasized that this adware program might even expose you to threats. If you do not want this to happen, make sure that you remove ThugTracker from the system. It is very likely that ThugTracker has entered your system together with some kind of untrustworthy application. You have probably downloaded it from Cnet, Brothersoft or Softonic website. If you do not want to allow suspicious programs to enter your system in the future, you should install an antimalware tool, such as SpyHunter, on the system. In addition, our specialists recommend that you always download programs from their official websites only. Of course, it is very important to check whether the program is trustworthy prior to the installation because undesirable programs might have decent-looking websites as well. It is very important that you remove ThugTracker from your system as soon as possible because there is a huge possibility that this adware will cause harm to your PC during the time. 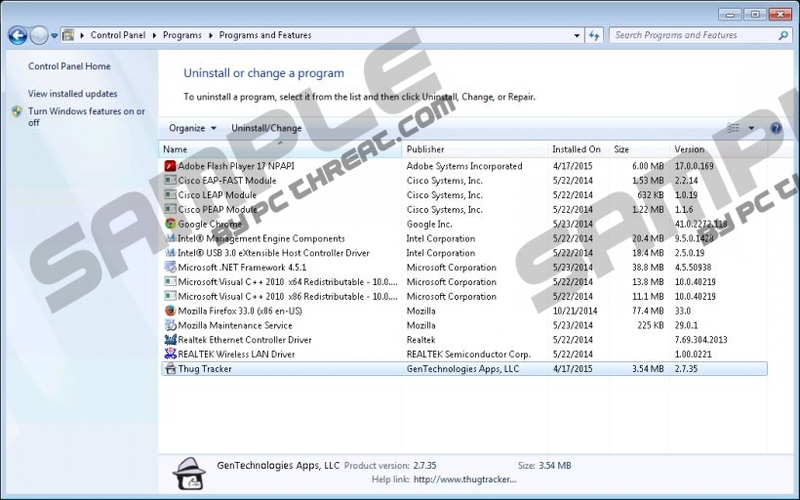 The easiest way to remove this program is to scan the system with an antimalware tool. Of course, you can delete this software yourself as well. All you have to do is to perform the removal steps indicated in our manual removal instructions (see below). Do not forget to check whether your system is really clean after the manual removal of ThugTracker. Quick & tested solution for ThugTracker removal.